Traditionally, organization design (OD) is an area of expertise focused on the roles and formal structures of organizations. The main goal of OD would be to design the organization in such a way that it makes it possible for the company to reach its vision and thus facilitates the growth. But the world is changing, and the digital era calls for a fresh view on how to design organizations. Organizations are now operating in a globalized, dynamic world and see their workforce change from homogeneous to diverse and educated. Innovation is almost always focused on information, is knowledge-based, complex and customized – which shortens the time to market and increases first mover advantages. All this, calls for more organic, innovative and learning organizations that are lead by strategic leaders (Greiner, 2004). As a result, to facilitate the growth of a company, organization design needs process view. In stead of formalizing the structures and architecture, a company that is in the process from start-up to scale-up needs to formalize its processes. Roca wrote a pretty good article about that a while ago: from the sandbox to the hive (Model for Organization Design, Roca). Many popular tools are based on this process view on organization design. Think about The Lean Start-Up (Ries), Agile, Business Model Generation (Osterwalder) and Customer Development (Steve Blank). What all these tools have in common is that they suggest an easy to use model that is usually cyclic, includes iteration, is non-lineair and are focused on a way of thinking. In my quest to place these tools into perspective, I generated a new integrative model: The Lean Scale-Up – how to get from start-up to scale-up. Below you’ll find an overview of the model. You can download the full infographic nu entering your email address above. Of course, the idea originated when I was reading somebody else’s perspective on entrepreneurship – and more specifically on the Lean Startup. It was the Nordstrom Innovation Lab who firstly created the following image on the relation between Design Thinking, Lean and Agile. Simply beautiful. It helped me, and many other to understand the link between the three in more detail. The problem of that model is that it ‘stops’ at the lean startup, while scaling-up is one of the most intriguing aspects of Organization Design. During the start-up phase, organizations are very informal (both processes as structures), but in the process of scaling up, companies need to formalize their processes. Dyer and Furr (Harvard) took it one step further. 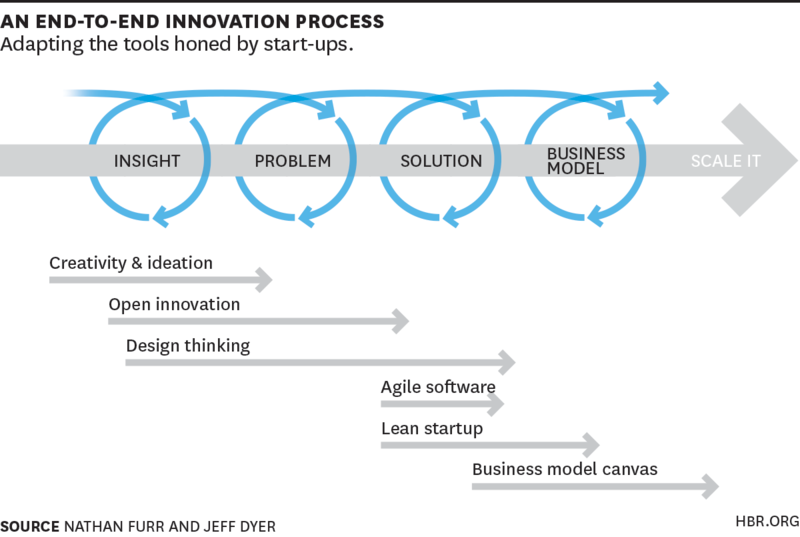 In their model “End-to-End Innovation“, they proposed a cyclic view on innovation that included design thinking, lean thinking, agile, but also business model design and scale-up. It also related Open Innovation to the cycles, but I think they are wrong by placing OI only in the front end of innovation. Naturally, innovation is a messy process and you may find that you start somewhere else on the figure (e.g., you already have a solution or business model innovation in mind), but the figure helps us remember that even in these cases, each element has to be addressed before you try to scale the business—or you are in grave danger of failure. We can achieve the same for Value Propositions by combining the VP Canvas with the Lean Startup process. This will help us more systematically work towards achieving what the startup movement calls a product-market fit or problem solution fit. In other words, building/offering stuff that customers really want. So, in practise, these two are more often combined with each other then followed by each other. The research cycle was partially based on ResearchMap.info and Barringers work on New Ventures. The last cycle, whick takes up 95% of the actual time that businesses are alive, is based on Greiner’s work on revolutions and evolutions as organizations grow. We have wrote on that before, for example in this post. And last but not least, we have included the funding process of businesses in the scheme. Not very detailed, but you’ll get an idea. Thnx for your interesting article about the lean scale-up. I placed a request for the infographic, it looks impressive. Hope it is, after receiving it by e-mail. 1. There are several stages of development: ideation, problem-searching, problem-solving, product -or service development, businessdevelopment. The methods we use e.g. design thinking- customer development – lean development – business modelling etc., we almost all combine them in every stage. And not followed by each other. Why? That brings me to my 2nd point. We experienced that the idea/the solution is NOT the product that needs to be tested. It’s the first businessmodel with the riskiest assumptions (what the PROBLEM and do I hit any CUSTOMERS?) that needs to be tested. Over and over again, until you’ve the right model. So the businessmodel is the PRODUCT of your startup or organization. With this method you have no or just a few minor future scale-up problems after you hit the product-market fit. Your businessmodel has been developed at the same time. The modelling for your Organization Structure & Culture like Roca suggests is much easier now. Therefor I disagree with “ A Business Model is only a topic when growing” by Mr Furr. p.s When I was placing the request for your scheme, the opt-in form appeared and blocked my sight. Thank you Hans, I think you’re right. An interesting article about Business Modeling and its role in a company’s strategy is the paper from Trkman & DaSilva. Hi, I’m designing a syllabus for a course of innovation and technology management at postgraduate level. I want to study infographic pdf to decide if it is appropriate. Dear Luis, Thank you for contacting me. Yes, it would be excellent material. Please refer the students to this website or openinnovation.eu for downloading material (don’t spread or publish the infographics directly to the student portal).